In keeping with last week's theme of getting my life together (and believe me, I'm not there yet, just getting closer!) - a big help for me has been a workable to-do list! My old modus operandi consisted of sticky notes, notepad paper....anything I could grab at the 'initial opportune' moment and then couldn't find later when I needed it. I have lost so many lists in my lifetime that it's not even funny. One of the "Getting Things Done" tenants is to use a list system that works for you! So I set off to find it...clearly my sticky notes weren't working! One of the reasons to use a list is that in our busy lives, our brains are being asked to remember far more info than is practical - we have so over-loaded ourselves that instead of remembering things at the proper times, we either totally forget the info or remember it at the most inopportune time! SimpleMom has become one of my newest favorite blog reads - she's done a series on productivity (that definitely has helped spark some progress for me) - she created and offers as a free download the Daily Docket partially pictured above. Great resource for sure! I really like the Daily Docket, and had my sweet husband not continued looking further, would still be using it. I used it for about a week - first starting with daily printed copies and then simply duplicating it on my computer, and typing in the blanks every day. However, I found that I put a lot of info in the misc. notes section at the bottom (not pictured here) and had to copy it over day-to-day. Then Brad found several different online list systems and I fell in love with 'remember the milk'. RTM is a free online list system that allows you to also share and send tasks to others - something that works great for us, both in our personal lives & business lives. I have tabs for the grocery store, walmart, personal, etsy, work, books I want to read - I can essentially have a list for anything I can think of. RTM makes it easy to create recurring tasks - my husbands uniforms need to be out ready to be picked up every Weds morning - trash day is Thurs for us - those are recurring reminders. Simple, I know, but prior to this resource, every week I would find myself thinking, "OH NO - uniforms - oh wait...it's Tuesday" - I haven't had that thought once that I can remember since putting it on a list. We are working under the premise to put EVERYTHING ON THE LIST! Once it's there, my brain no longer has to remember it, and is freed up to do more important tasks. We spent a couple of days and just brainstormed everything we could think of...more items have come to us in the following days, and we contiue to add them. It's been great - far less stress - and for once, I am checking things off my list! RTM will allow you to set a due date for a task or leave it open-ended. My grocery & walmart lists are open-ended...simply a good spot to store what I need. My work tasks (and some personal) get dates...it helps me keep priorities in line and not miss deadlines. You can pay to upgrade to a 'pro'status and that allows you to sync your lists with a hand-held device. It's just $25/year - basically $2/month - for me that was a no-brainer. My phone now carries all my tasks in it and I can reference it for quick info when out & about & on the go! You can also print your lists with nice little check boxes if you'd like to carry them with you in paper form. Also great for the grocery list! RTM will also integrate with GoogleCalendar if that's a resource you use. At the end of the day, the list system you use just needs to work for you - there are lots of online tasks managers out there - RTM just happens to be the best one for me at this point. Do some looking around - think about your to-do list system...do you have one? is it working? Spend a little time tweaking it to make it work or make it work better and things will really start to fall in line! And if you already have a great system you love - I'd love to hear about it! 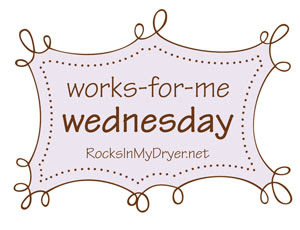 Head on over to RocksinmyDryer for more great WFMW ideas! Hope to see you next week!